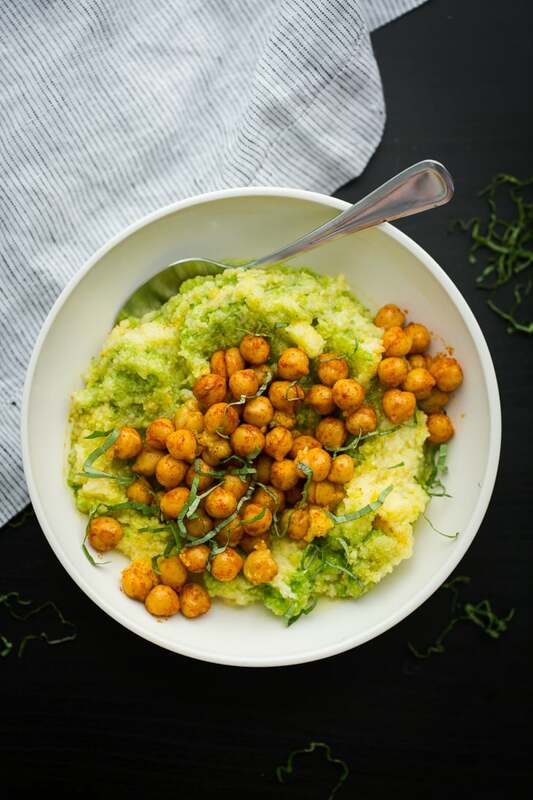 Spinach Pesto Polenta with Smoky Chickpeas | Naturally. When it comes to cooking, I strive to be a minimalist in the amount of dishes I use. If I can get by with one dirty bowl, instead of 3, but cutting a couple corners, I go for it. Sure, I don’t always follow recipes then but rarely does something not work out because I didn’t use two bowls. I like to take a similar approach to cooking. If I can get by with making one sauce and use it for more than one meal, I do it. If you follow along with this site regularly, this pesto will probably look familiar given I just posted about it on Saturday with this noodle bowl. It’s the exact same minus the chili paste. What I normally do is make the pesto and then when I’m ready to make the noodle bowl recipe, I stir a dab of chili paste into the mix. This pesto recipe is also great tossed with other grains and pasta- it’s multi-use! As for the chickpeas, I would normally just toss a few plain ones on top but the time it takes to whip up these smoky chickpeas is so small, that it’s become a regular habit for me. Bring water to a boil, add polenta and salt. Lower heat and continue to stir polenta as it thickens. On the lowest heat possible, continue to stir occasionally and let polenta cook for about 20 minutes (longer if you want the flavor to develop more). While the polenta cooks, combine the ingredients for the pesto in a blender or food processor, running until everything is well combined. Set aside. To make chickpeas, heat olive oil over medium-low heat. Add the chickpeas, paprika, chili powder, and sea salt. Cook until chickpeas are hot, 5 to 6 minutes. 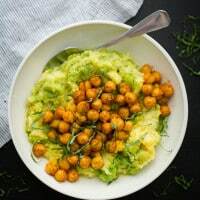 To serve, fold in 3 to 4 tablespoons of the pesto into the polenta, top with cooked chickpeas, and serve any extra pesto on the side. Amazing! I’ve never tried polenta, but I heard it’s delicious! I love the look of your smoky chickpeas. Anything with smoked paprika is my fav.. and I think the soft polenta mixed with the sauteed chickpeas would be delicious! Looks so hearty and fulfilling <3 YUM! Looks absolutely satisfying and easy to make, love it! I just found an easy way to make polenta: Dice a packaged precooked polenta “log” that you can get at the supermarket, heat the pieces in broth, smash it up, and voilà! Your chickpeas sound marvelous (will cook some up tonight), and what’s great about your idea is that any chickpea leftovers will make a terrific hummus. Thanks for your great ideas, as always. Such a beautiful, spring-like bowl. Sounds super delicious! Looks delicious. I’ve always wanted to make my own pesto. What a beautiful dish! I love everything about this meal and it’s perfect for spring. lovely composed dish! 🙂 you truly have an inspiring blog here 🙂 I am so happy I discovered it! This was a perfect weeknight meal – loved it! I used a hot chili powder and sprinkled some feta on top – so lovely.